Gooey Mounds Brownie Cups came about when I was helping my friend Julie stuff goodie bags at her house this past Sunday and her one request was to bring something chocolatey. Julie was kind enough to give me carte blanche to create anything I wanted. I LIKE when friends tell me this! My schedule was a tad busy over the weekend and I knew that I would not have a lot of time to play in the kitchen. Additionally, you will see that I have added a very cool feature to my blog…a video! I am still getting the hang of how to shoot a video on my own without subjecting you to being a part of my kitchen for hours on end! Gooey Brownie Cups is one of my favorite desserts when I want an intense chocolate taste. Additionally, it is one of the easiest recipes I make. I wanted to add a twist to the traditional Gooey Brownie Cups and since I love Mounds candy bars, it was easy to decide what to do. Do you remember the jingle, “Sometimes you feel like a nut. Sometimes you don’t. Almond Joys got nuts. Mounds don’t.” Am I the only one who read that and started humming at the same time? Well, I was not feeling nutty so Mounds won. I adapted the center of the Chocolate Coconut Bonbons to use in my Gooey Mounds Brownie Cups and this worked out beautifully. The Cups have the decadent chocolate taste with a fabulous coconut center. I was able to put a gigantic smile on Julie and her son Aaron’s face when they each had one and I hope my video puts a smile on your face, as well. Be sure to let me know what you think as my new ‘video career’ begins! Place all of the ingredients into a small bowl. Stir until completely blended together. Line a small baking pan with aluminum foil. Scoop about 1¾ teaspoons of filling into a ball and place onto the baking sheet. Freeze for 10-15 minutes. Lastly, use a wooden spoon to mix in the chocolate chips. Most will melt, but you may have some that still hold their shape. Spray the pan with non-stick cooking spray. Use a 3 tablespoon scoop to transfer the brownie batter. 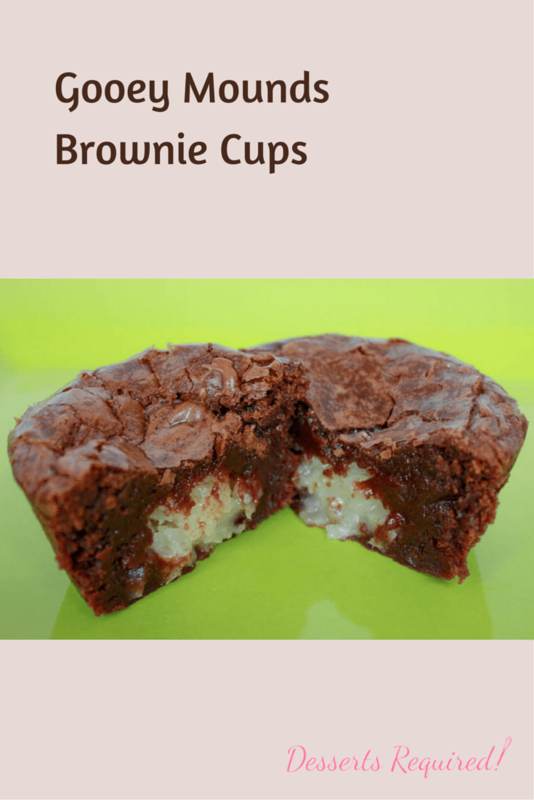 For each cup: scoop out half of the brownie scoop (1½ tablespoons) into the muffin cup – place a mounds filling over this – top with remaining 1½ tablespoons brownie batter. Remove and cool completely in the pan. 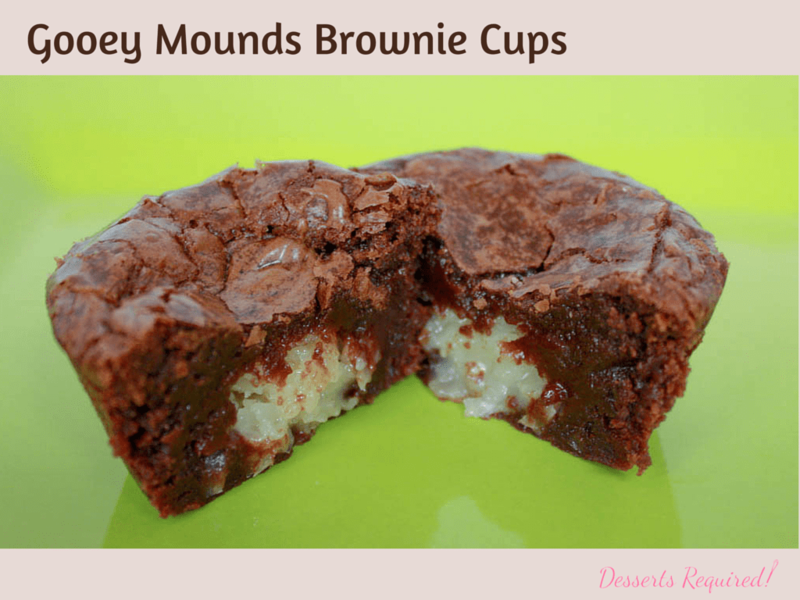 Use a small metal spatula to go around the edges of the Gooey Mounds Brownie Cups. The more the chocolate chips melt, the more chocolatey your cups will be. I use a 3 tablespoon cookie dough scoop to transfer the brownie batter into the muffin cups. I eyeball the 1½ tablespoons of batter for the bottom and top of each Gooey Mounds Brownie Cup. Some may have a tad more on the bottom than the top and vice versa. No worries…they all taste great! LOVE the vlog. You did a great job. And the Mounds version of the Brownie Cups look amazing! Thanks so much! I had a lot of fun making the vlog…and the recipe. You weren’t feeling like a nut? I thought you were always a nut Betsy 🙂 These brownies look yummy! Amazing!!!! I can’t tell you how excited I am that you are doing videos. Now, I can see everything I have been doing wrong, such as not having my ingredients in order before I begin and not lining things up as I proceed. I always thought your website (your step by step photos) made baking fun and easy for me for the first time in my life. I had no idea that things could be made even easier and more fun. Please continue the videos. As a matter of fact, if you have nothing to do someday, you have my permission to go back to some of your old, more complicated recipes and video those, as well. I’ll be happy to name some, if you like! You could start with your wonderful truffles, where I end up with my utensils falling into the hot chocolate, resulting in burned fingers every time. Only reason I keep coming back is the the truffles are delicious and worth the pain. But, they’d be so much better without the pain! Thanks so much!! I wish I could tell you that I will be adding vlogs to all of my previous posts, but I think the more realistic answer is that I will be making more truffles in the future and will be sure to do a video for those! I loved the video. You are great at this! Betsy, the video is fantastic. Your recipes were already so easy to follow with the pictures, but the visual of you actually doing the preparation adds a whole new dimension. I loved the little tips on organization; I usually make a big mess. Haven’t tried the gooey brownie cups yet, but they look delicious, and I’ll be making them soon. Congratulations on the terrific new addition to your blog! Thank so much for your feedback. We all make a bit of a mess in the kitchen. It’s just nice to be able to take a few shortcuts whenever possible! I LOVE them, too! Good thing Halloween is coming soon. I have a feeling my son’s Mounds bars will disappear quickly!! I could eat 12 of these right now! Best compliment!! I think I’ll join you!